An unspeakably cruel crime in Los Angeles County has not only caused outrage but led the Board of Supervisors to offer a $25,000 reward for information leading to the arrest of the person or persons responsible. Sheriff’s detectives are investigating several incidents of dogs being burned with a chemical agent between July 20 and August 20 in the Antelope Valley area. The investigators want to find out if the attacks on a golden retriever and the other dogs are related, what chemical or material was used in the attacks, and if there are any more victims. These crimes first came to light August 11 when a Golden Retriever was brought to a Lancaster animal shelter with severe burns on the neck and back. The dog, believed to be a stray is now named Fergus. Fergus was turned over to the Animal Medical Center of Southern California in west Los Angeles for treatment. Fergus was found wandering the streets of Lancaster with the third-degree burns on his back and neck. The doctors believe that somebody poured battery acid or a similar type of corrosive liquid on the dog. A GoFundMe page has been set up by the Golden Retriever Rescue Group to raise funds for his recovery, and that fund has already raised more than $24,000. In recent weeks two other dogs have been brought to shelters with similar burns, but were so severely injured they had to be euthanized. A fourth dog, a pit bull mix is recovering from the same type of chemical burn in a Lancaster shelter. 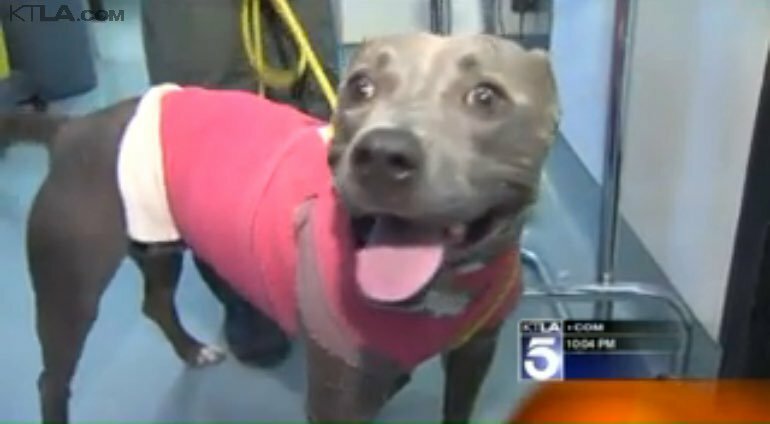 Los Angeles County Animal Control officials don’t know if these dog abuse cases are connected. PETA previously offered a $2500 reward for the arrest of the person responsible, and the Lancaster Sheriff is asking for help from the public. Anyone with information about these incidents is encouraged to call Detective Daniel Gore at 661-940-3851 or 661-948-8466. You can also contact the LA County Department of Animal Care and Control at 661-974-8096. Several reports on social media that dogs with similar burns have been found in the San Bernadino area but nobody could confirm those reports so this crime could be more widespread than first thought.